Amazon FBA Private Label: EP3 - Learn How You Can Do Business And Stay Safe. 03:56 What is on-time shipment assurance? 05:00 What is pre-shipment product quality and how it works. 07:40 Companies that don’t want to use trade assurance. 09:18 What to do when the company does not have trade assurance? 11:10 When is a buyer less likely to win a dispute claim? Alibaba is a sourcing website that helps people find manufacturers in China. Just about anything can be found on Alibaba through thousands of suppliers. Unfortunately, a lot of suppliers should be avoided for one reason or another. But how do you know who you should contact and who you should avoid? Alibaba’s website does offer us a few options to sift through this large list of suppliers and narrow it down to companies that meet a certain level of criteria that weeds out most of the crooks or fly-by-night operations. These options are: gold supplier, assessed supplier, and trade assurance services offered. In order to become a Gold Supplier, a manufacturer goes through a verification process with Alibaba that ensures they’re a legally registered business. This alone definitely helps filter out the scammers from the legit suppliers. Alibaba also shows the length a company has been a gold supplier, which helps add to the confidence level; scammers usually aren’t able to hang around for longer than a few months. 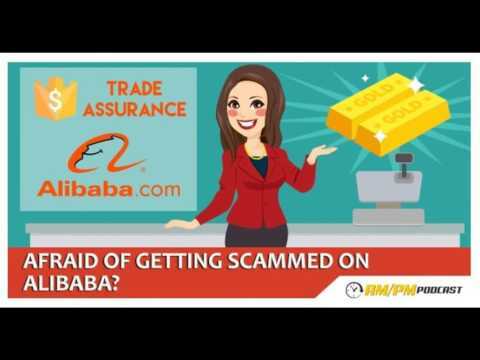 Essentially it’s harder to get scammed on Alibaba if you are dealing with time-tested suppliers. If trade assurance option is selected, the website screens the suppliers based on offering trade assurance or not offering. This is a type of insurance that protects buyers by adding an extra layer of security to money used to purchase products. It’s important to notice the amount of the coverage. Some companies may only have a couple thousand dollars worth of insurance, whereas other companies may offer tens of thousands of dollars in coverage. There will be a link on the right side of the page that shows the actual amount of insurance that is being offered based on the volume of product ordered or amount of money spent. Be sure that this amount covers your full order value. There are two types of trade insurance: on-time shipment and pre-shipment product quality. On-time shipment safeguard assures the buyer that if the supplier is unable to meet the agreed deadline for shipping, Alibaba will cover the amount lost. This is rarely enforced by the buyer because once it is added suppliers generally make an effort of meeting the deadlines set. And even if they don’t, you’re typically going to wait a little longer to get your product vs. filing a claim with Alibaba. Pre-shipment product quality guarantees that the product paid for is the same product that will be received. You can hire an inspection company to go out and do a full inspection on the product to ensure that everything is as ordered and packaged as requested. The factory could provide this service; however, it’s recommended to get a third party involved in order to ensure a more impartial inspection. The trade assurance process is simple. When you’re ordering a shipment, a payment is made through wire transfers into an Alibaba account in the supplier’s name. The money is not immediately made available to the supplier. Once the supplier has made the products and passed the pre-shipment product quality inspection, Alibaba releases the payment into the supplier’s account. There are suppliers whose page states that they have trade assurance yet they try to talk you out of using it. Stay clear of those suppliers! If it seems sketchy or they claim that there is a trade assurance fee, look for another supplier. There should be absolutely no fee for using trade assurance. If the supplier does not offer trade assurance and there is no other supplier for this product, find out the reason for this. You might wish to wonder why they are the only supplier for these particular products. Is there a patent on the product? In this situation be sure to proceed with caution. If you still want to move forward with the order, use PayPal. PayPal’s dispute window is 6 months, so there is enough to time to raise this claim. If a claim is made, the seller and the buyer have 20 days of resolving this issue. If it is not resolved within 20 days, the claim will go to PayPal’s review team. The great majority of claims are closed in favor of the buyer, unless the product made was custom made or it is contrary to what the buyer is claiming. 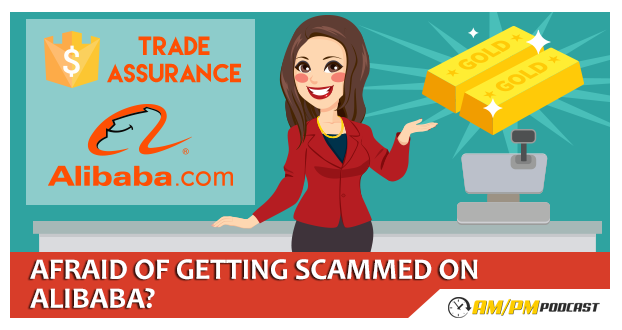 If you’ve been worried about getting scammed when placing your first order with suppliers from China, you now know there are ways you can do business and stay protected. Don’t let the fear of getting scammed keep you from taking advantage of a great opportunity! If you have any questions or concerns, be sure to join our community on Facebook and subscribe to the AM/PM Podcast today!